When work space is very limited, a combination keyboard and monitor mount can lift your workstation up off your desk. With a built-in mouse pad and included wrist rest, this pole-based arm provides a great deal of adjustability while only requiring a small amount of flat surface to clamp to. Two hinges allow the entire setup to be swung anywhere around the pole. 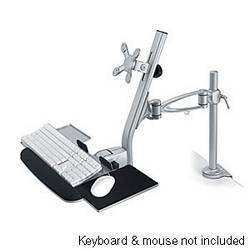 Includes desk clamp and mounting hardware. Assembly required. Monitor, keyboard, mouse and cables not included.